On Eternal Patrol Memorial Reef is a boat accessible salt water dive site, located in Sarasota, FL. The maximum depth is 41-50ft/12-15m. apnews.com/e9265f77c41545888748af3e2e56409f — An undersea monument off Florida’s Gulf Coast will honor more than 4,000 officers and crew members who have died while serving aboard American military submarines since 1900. The On Eternal Patrol Memorial Reef will be installed on the ocean floor about 9 miles (15 kilometers) from Sarasota. 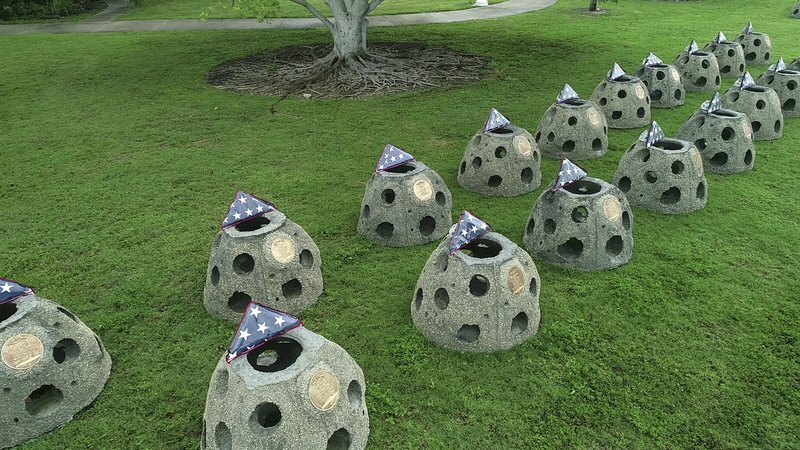 The artificial reef will consist of 65 reef balls, each bearing a plaque identifying a submarine lost while on duty. One additional ball will represent crews and submarines lost in non-sinking incidents. Each ball weighs 1,300 pounds (590 kilograms) and stands 3 feet (1 meter) tall. Subtropical Storm Alberto’s crossing of the Gulf of Mexico delayed the installation of the first ball Monday. In a ceremony Sunday, buglers played taps and a military honor guard presented American flags to representatives for each lost submarine. A gathering of small watercraft at the site nine miles (14 km) off the Gulf Coast that was planned for Monday, Memorial Day, was postponed due to an approaching storm. A ceremony will be held on Sunday 5/29/2018 at a park in Sarasota, Florida to dedicate the first-ever undersea memorial for U.S. submarines lost at sea and the men who gave their lives while serving aboard them. A reef ball is a designed artificial reef, specifically engineered to mimic Mother Nature; when deployed to the ocean floor, the reef ball quickly assimilates into the ocean environment and begins to replenish the diminishing natural coral reefs. New marine growth begins in as little as three months. More than 700,000 reef balls have been placed in 70+ countries and, since 1998 nearly 2,000 Eternal Reefs have been placed in 25 permitted sites off the U.S. coastline. An Eternal Reef is a reef ball that incorporates a person’s cremated remains giving family and friends a permanent underwater memorial for their loved one. The 66 Eternal Reefs in the On Eternal Patrol project will contain no cremated remains, only a bronze plaque on each, recognizing the lost veterans and their boats.